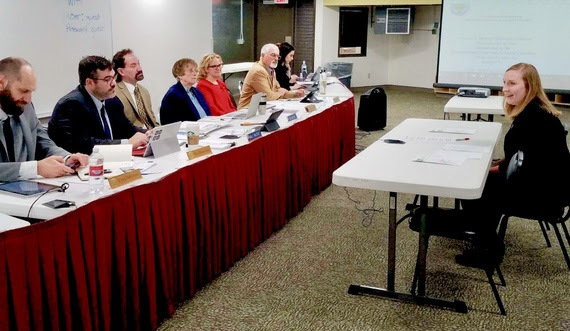 State Superintendent Jillian Balow sends an update to school district superintendents at the end of every week so they can see the memos which will be sent out the following week and highlight statewide education work. There is no consistent definition for “rural” except “areas that are not urban.” Rurality is defined at least 72 different ways by the federal government. Think tanks, majorities, and education philanthropies are located in cities. This is just one of many reasons rural education reform doesn’t usually gain traction. While diverse yet undefined rural “regions” exist (deep south, northeast, midwest, west, southwest), rural areas and schools have much in common especially around pride in schools, social cohesion, shared values, and parental involvement. STEM Teacher and State Board member, Ryan Fuhrman, engages in discussion with the computer science standards committee in Lander this week. The committee is reworking and refining the standards. Who says you can’t be two places at once? I greeted the computer science standards committee via video from my meetings in Washington, DC. 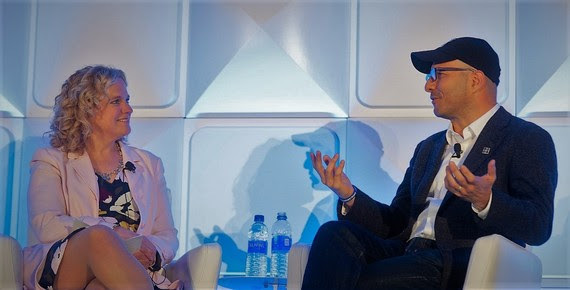 It was so much fun to interview Hadi Partovi, founder and CEO of code.org, on-stage after his keynote speech at the CCSSO opening dinner. WDE and school districts are coordinating multiple training opportunities for the summer. 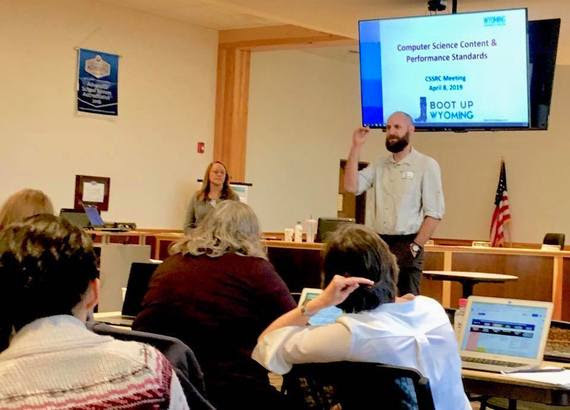 Of note and in this week’s memos, Wyoming received a grant from Microsoft to provide Computer Science training for teachers and registration is available for the annual STAR conference. WDE teammates were in Cheyenne Thursday with K-12 science teachers working in Performance Level Descriptors and Blueprints for the 2016 Science Standards. Thanks to all our educators who take the time to help strengthen Wyoming’s standards. Look carefully, you may recognize faces of your former students. These UW biz students presented their investments to the State Loan and Investment Board on Thursday. I was on the Wyoming road again this week and visited Park County. The organization CodyForward invited me to speak at their annual dinner about economic development and education. Lines between workforce, economic development, and education are blurred as we stay focused on responding to workforce data, post-secondary attainment, and career, college, and military readiness. Simply, Wyoming is evolving from needing a workforce to needing a skilled workforce and education is the key. 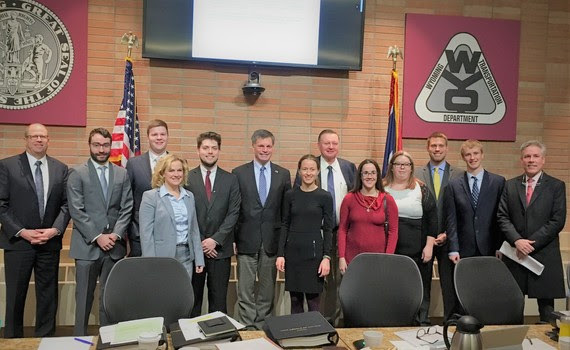 Wyoming’s five statewide elected officials comprise the State Loan and Investment Board (SLIB). Recently, the Auditor, Treasurer and I visited Park County businesses supported over the years by our partnership. 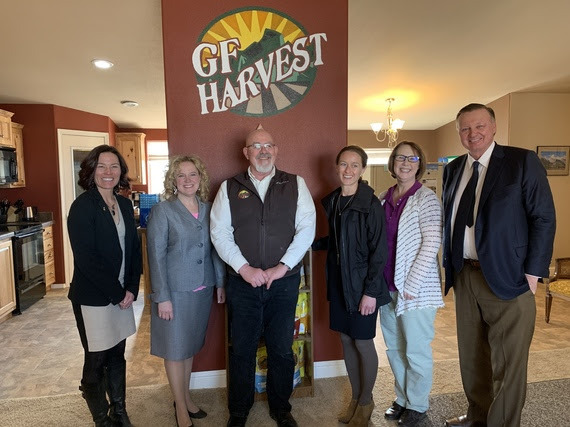 Powell Economic Partnership (PEP) organized a tour of GFHarvest. This company started as an FFA project for the owner, Forest Smith (also a State Board of Ed member). It was another busy week on the Wyoming road and a privilege to visit schools (with better travel weather this week). Also this week, WDE hosted a workshop called the “Importance of Indian Education for All.” Teachers were trained on how to integrate new standards into Social Studies and other subjects. Schools have three full years to implement Indian Education for All content and performance standards. There are pertinent memos this week including one about next steps for WDE and school districts after the legislative session. 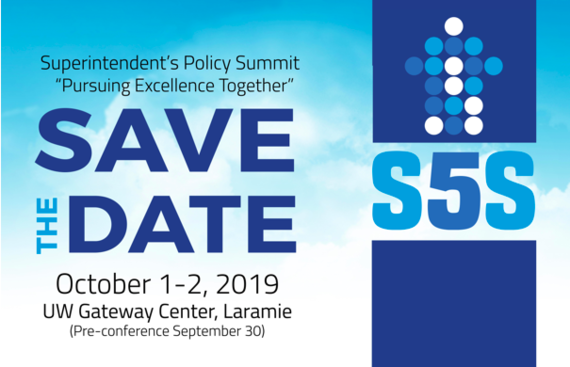 We are working to schedule a debrief call for superintendents to “attend,” as we have in the past. In the meantime, please contact WDE staff with questions. There is also a memo about 21st Century Learning grants (21CCLC). Substantial grant awards to schools and other entities are available to build out a variety of activities including extended learning, computer science, and more. 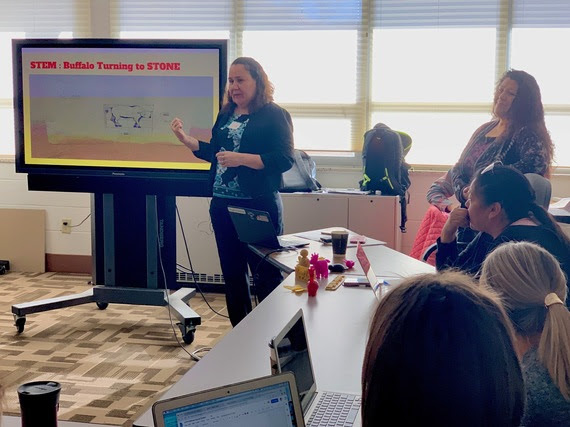 Iva Moss-Redman, a STEM teacher with Fremont County School District #38, discusses how to bring STEM education to social studies curriculum during the Indigenous Tribes of Wyoming – Importance of Indian Ed for All workshop in Lander. 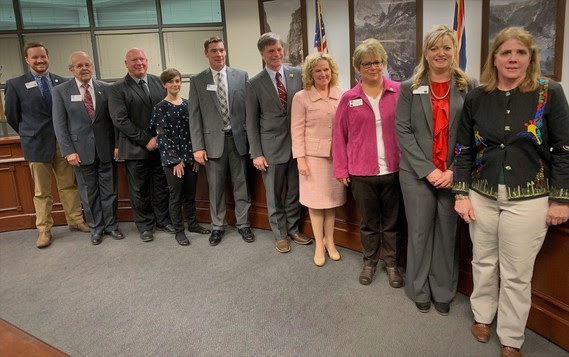 The State Board of Education welcomed Valerie Bruce, Wyoming’s 2019 Teacher of the Year, to its meeting Thursday. Bruce is a first grade teacher at Rozet Elementary. 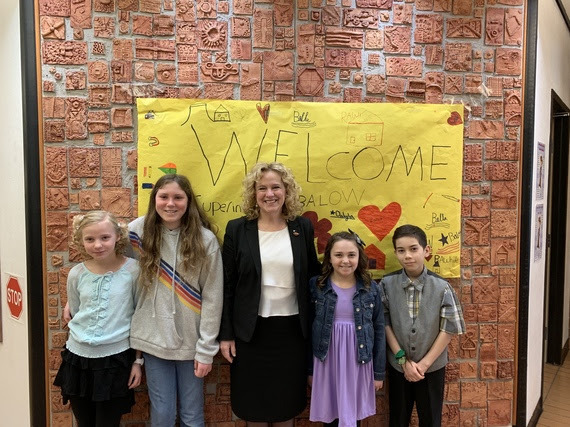 Elected student officials from Rawhide Elementary in Gillette greeted me and gave me a tour of their building. 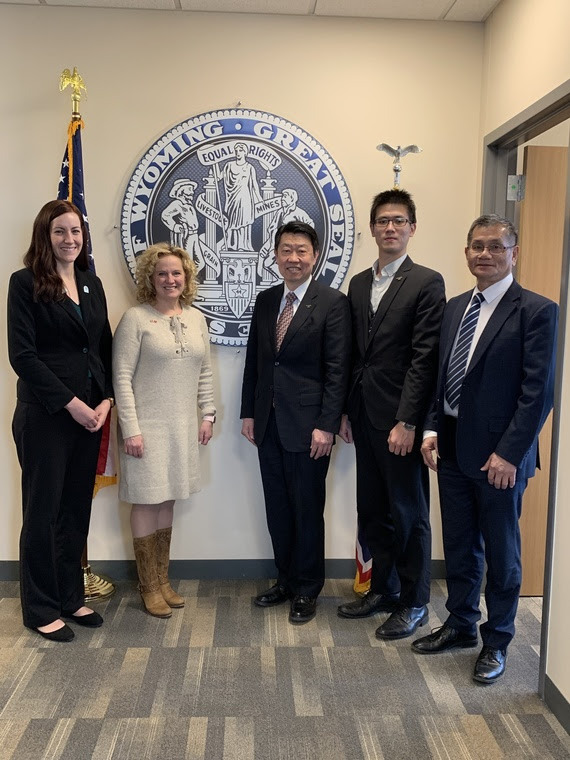 Wyoming has an ongoing dialogue with Taiwan about energy, business, and education. Officials met early in the week to discuss teacher and student exchanges and Dual Language Immersion (DLI). 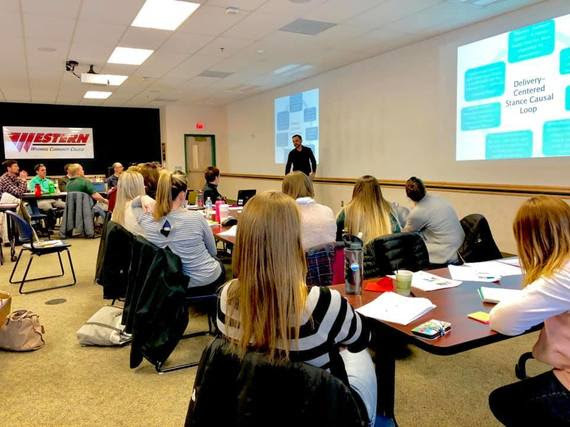 While much of the state continues to dig out from our huge snowstorm, it’s not surprising that educators evaded the weather and roads to attend PLC trainings presented by Solution Tree. 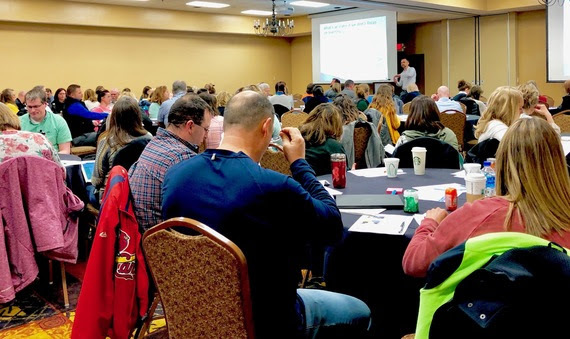 More than 125 educators from across Wyoming traveled to Casper Tuesday for Solution Tree’s Collaborative Teams II Training with Aaron Hansen. We salute your dedication! 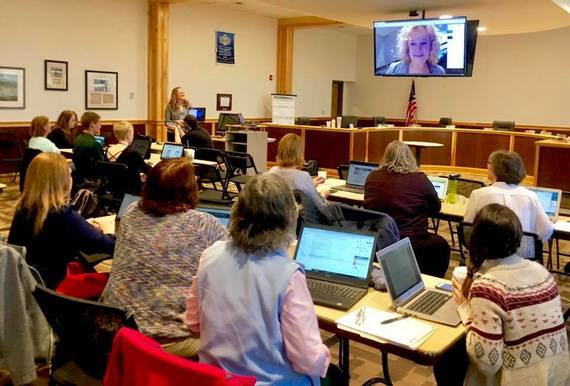 Educators from Green River, Evanston, and Pinedale navigated wet and snowy Wyoming roads to participate in the WDE’s Statewide Systems of Support-sponsored Solution Tree Collaborative Teams II workshop in Rock Springs. 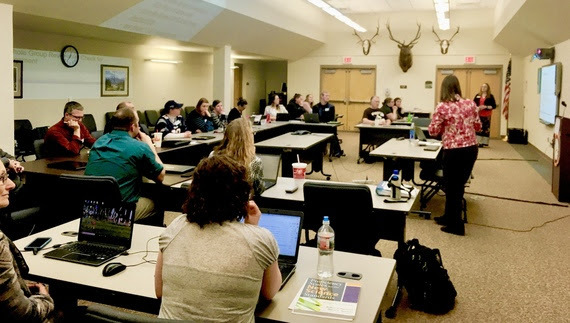 Aaron Hansen customized the training to meet the needs of these Wyoming educators! It was a great week to be on the Wyoming road (despite a wintry 4.5 hour drive from Casper to Cheyenne on Wednesday night). Thank you to the superintendents who shared students, teachers, and innovations with me during my visits. It is truly a joy to be a champion for Wyoming education–there are so many great things going on! I also appreciated the opportunity to visit with educators about computer science, legislation related to reading assessment and intervention, and the Hathaway Scholarship. My staff is working to “unpack” the impacts of the legislative session and we will announce a tele-conference debrief for superintendents soon. On the national front, First Lady Melania Trump is promoting her Be Best initiative, which includes the well-being of children, online safety, and opioid abuse. I am particularly excited about this initiative as we continue to talk about student well-being (social-emotional) in the context of school and student safety. Wyoming Teacher of the Year, Valerie Bruce, with her students. 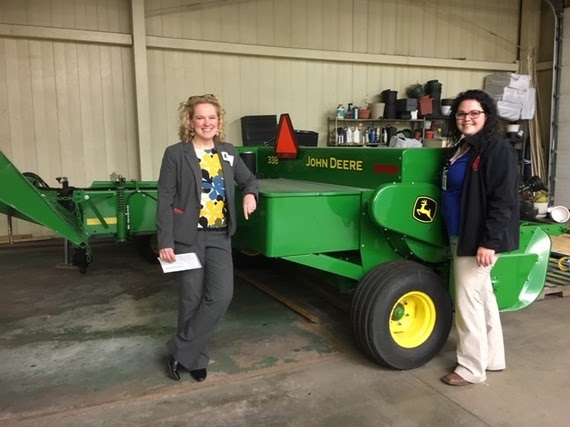 Riverton FFA and Welding teacher, Taylor Haley, shows how her district spent Perkins funds. 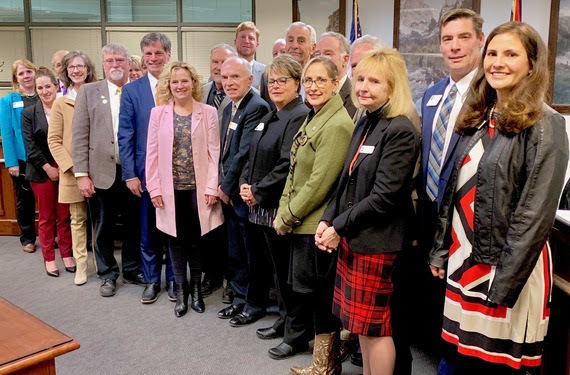 The Wyoming Legislature adjourned for the 2019 session in the early morning hours of February 28. As has been our practice, we will analyze the impact of new legislation and schedule a debrief video conference with superintendents and others. Meanwhile, Governor Gordon continues to sign bills into law. On the national front, President Trump signed into law the Consolidated Appropriations Act, 2019, providing funding for the remainder of Fiscal Year 2019 for all federal government agencies and programs not yet included in enacted appropriations. While funding for the Department of Education was enacted back in September, the new bill contains $100 million for the Department of Justice’s STOP School Violence Act. It also contains $110 million (an increase of $10 million above last year) for the National Aeronautics and Space Administration’s (NASA) STEM education programs. 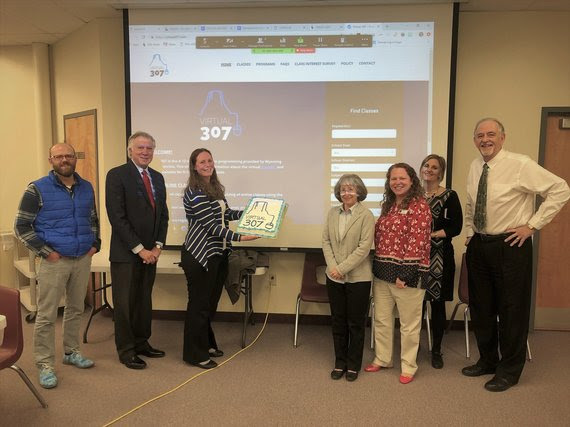 The WDE celebrated Digital (Virtual) Learning Day in style–with Virtual 307 training and cake. Students, educators, board members, law enforcement, lawmakers, and others celebrated as Governor Gordon signed a bill to stiffen penalties for driving past a bus with the STOP arm down. Last Friday the Wyoming House defeated a bill that would have created a framework for school safety and security. Specifically, it would have required inter-agency collaboration at the state level to develop guidelines and best practices for schools. Also, the bill would have emphasized specific aspects of school safety and security plans and professional development. Student safety and well-being is a priority we share. While I was disappointed in the outcome of the bill after unanimous passage out of the House Education Committee, I remain committed to keeping student safety and well-being on our front burners. At times, it feels like a challenge to bridge school security and student well-being. 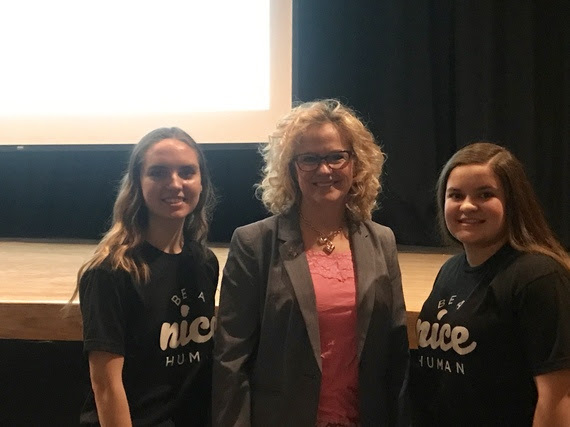 Recently I had the opportunity to attend a Rachel’s Challenge student assembly. In a word, it was powerful; powerful for me, powerful for the students, and powerful for the safety and culture of the school. Many many schools in Wyoming and across the nation have hosted a Rachel’s Challenge events. Now, onto exciting news regarding Rachel’s Challenge: A supporter of the program has offered to pay a portion of the assembly fee for Wyoming schools. Because of the generosity of this Wyoming supporter, the “Immerse” program, that is typically $6500, is available for $2800. That price is “all-in.” This is a tremendous gift to Wyoming schools and the assembly is well worth it. Rachel’s Challenge has partnered for years with Dr. Bob Marzano and is bringing on a new partner in Scarlett Lewis, founder of the Jesse Lewis Choose Love Foundation. Below are a few links with contact information. Please reach out to me personally if I can assist you in any way as you pursue Rachel’s Challenge in your community. This is a positive, local, and impactful step toward ensuring student well-being and a positive school culture. Here is a link to the pricing and programming sheet with contact information. Once again, for Wyoming schools the “Immerse” package is $2800 versus $6500. 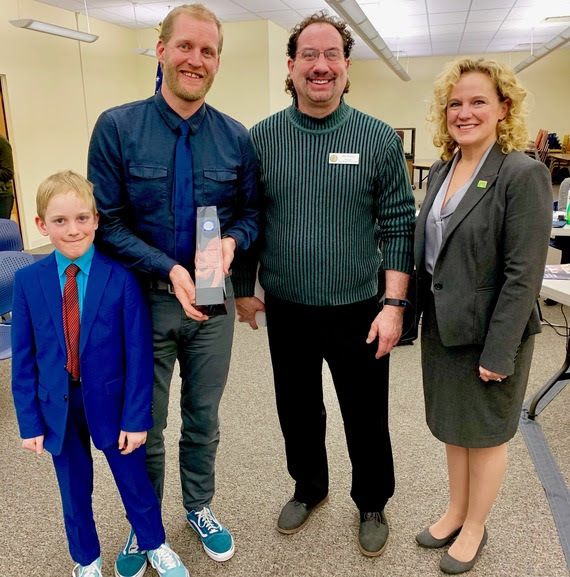 We also hosted the 2019 Wyoming Teacher of the Year. She represented teachers and education with poise, passion, and professionalism. The events are best told in photos. Enjoy! Memos will not be public until Tuesday, February 19 because of the holiday. 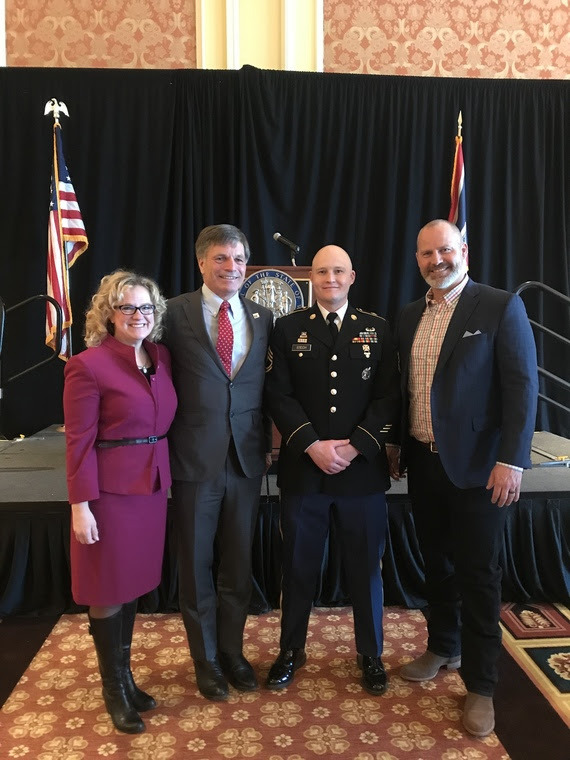 Governor Gordon signed a bill that expands the success curriculum to include CTE courses and makes the scholarship more accessible to students seeking workforce training after high school. 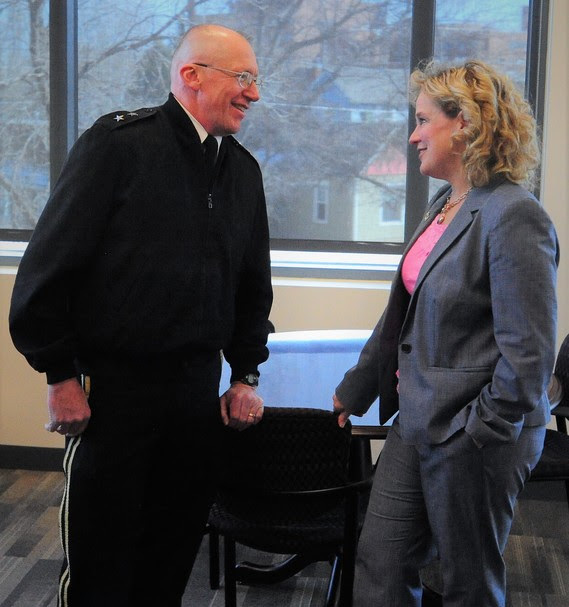 Business, industry, educators, and policymakers celebrated Friday afternoon. 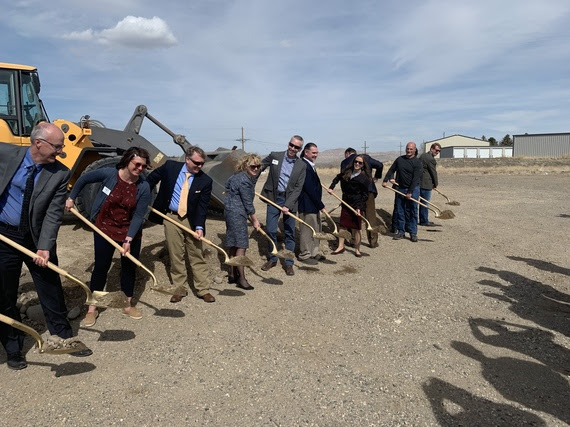 This evolution of the Scholarship also creates better alignment among Wyoming’s workforce demands, our education accountability system (which recognizes graduates who are prepared for college, careers, and military service), and scholarship opportunities. Here is a link to the media release. Valerie Bruce is a 1st grade teacher at Rozet Elementary in Campbell County. 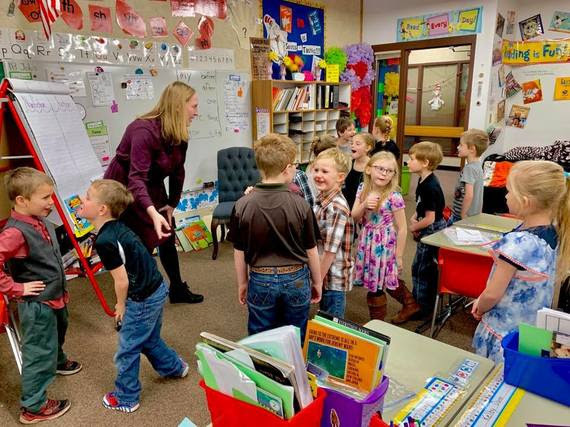 She is the 2019 Wyoming Teacher of the Year. During 2019, she will learn to advocate for the education profession and her passions in diverse settings. 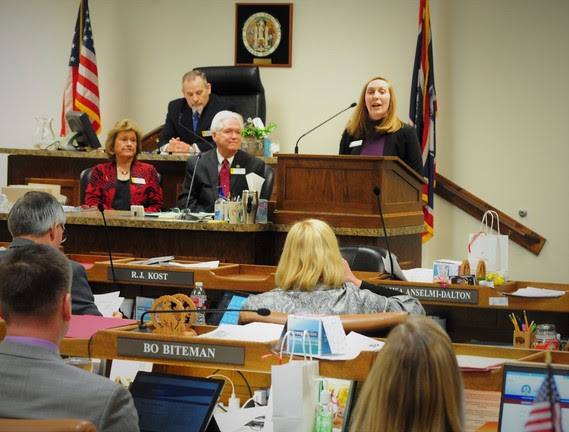 On Thursday she addressed the Wyoming House and Senate and talked about the importance of excellent teachers. Mrs. Bruce is a stellar advocate for teachers and Wyoming education. What a special week for Wyoming CTE students! 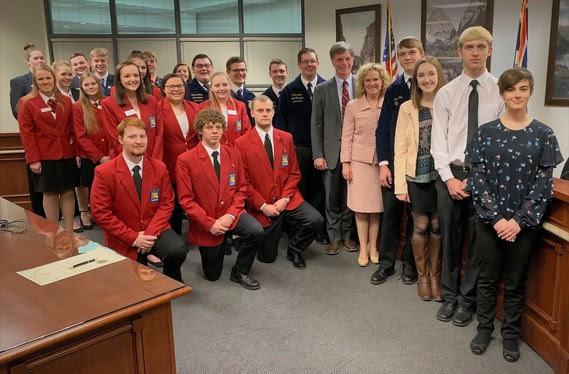 State officers from DECA, FBLA, FCCLA, FFA, and Skills USA visited Cheyenne for a special day of discussions with legislators, a Governor’s Proclamation, and good old-fashioned networking. We would love to see Wyoming educators, business and industry community members, and students participate in the Career and Technical Education (CTE) Month celebration. This is an annual Career and Technical Student Organization (CTSO) Twitter chat and it will take place February 19 at 3:00 p.m. Wyoming time. Be sure to use #CTSOchat when responding and let others know Wyoming is represented. State Officers from the Career and Technical Student Organizations (CTSOs) visited the Captiol this week. They represented all CTE students very well! Members of the business and industry community celebrated Governor Gordon’s signing of the CTE proclamation. This was the third proclamation signed by Governor Gordon. While important and well-intentioned, the supplement not supplant requirement was restrictive and burdensome, to the point that some districts made ineffective spending choices in an effort to avoid non-compliance. Under ESSA, the requirement changed to provide more flexibility to districts while still ensuring that federal funds are supplemental to state and local funds and cannot be used to replace them. In order to comply, a district need only show that its methodology to allocate state and local resources to schools does not take into account a school’s Title I status. For many districts, the requirement can be met using the district’s current methodology for allocating state and local resources. At the Wyoming Department of Education (WDE) we are committed to supporting you to spend federal dollars as flexibly as possible.